London’s special network of high priority roads for the Olympic Games starts operating on Wednesday 25 July, two days before the Games open. A workforce of about 2,000 is putting the final touches to the Olympic Route Network (ORN) that links all competition venues, Heathrow airport and other key sites. 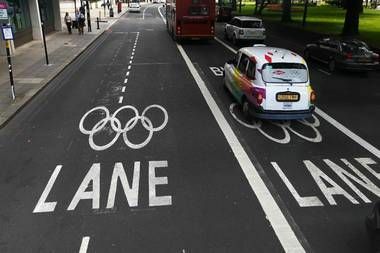 The ORN involves specially reserved lanes for vehicles transporting the teams, Olympic officials and the media, covering about 130 kms across the capital. Three special footbridges into Hyde Park are also being installed for spectators wanting to see Olympic events on large screens in the centrally-located park, as well as other cultural events scheduled during the Games. All maintenance work on roads around London has now been suspended, including those on the M25, M1 and M4. Tough fines will be imposed for traffic violations, and illegally parked cars will be removed and owners charged a £200 release fee on top of the fine and tow-away costs. Spectators are being encouraged to use public transport to get to events. However on 23 July two branches of the underground – the Jubilee and the Central lines – were suffering disruptions because of an electrical fault on the system.